The Nobel Prize in Physics is a yearly award given by the Royal Swedish Academy of Sciences for those who have made the most outstanding contributions for humankind in the field of physics. 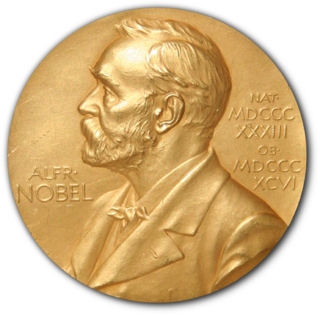 It is one of the five Nobel Prizes established by the will of Alfred Nobel in 1895 and awarded since 1901; the others being the Nobel Prize in Chemistry, Nobel Prize in Literature, Nobel Peace Prize, and Nobel Prize in Physiology or Medicine. The Nobel Prize in Chemistry is awarded annually by the Royal Swedish Academy of Sciences to scientists in the various fields of chemistry. It is one of the five Nobel Prizes established by the will of Alfred Nobel in 1895, awarded for outstanding contributions in chemistry, physics, literature, peace, and physiology or medicine. This award is administered by the Nobel Foundation, and awarded by Royal Swedish Academy of Sciences on proposal of the Nobel Committee for Chemistry which consists of five members elected by Academy. The award is presented in Stockholm at an annual ceremony on December 10, the anniversary of Nobel's death. 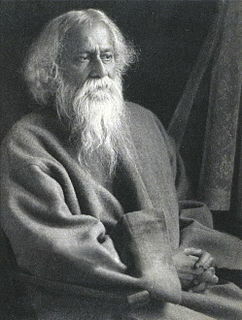 Rabindranath Tagore, also known by his sobriquets Gurudev, Kabiguru, and Biswakabi, was a Bengali polymath, poet, musician, and artist from the Indian subcontinent. He reshaped Bengali literature and music, as well as Indian art with Contextual Modernism in the late 19th and early 20th centuries. Author of the "profoundly sensitive, fresh and beautiful verse" of Gitanjali, he became in 1913 the first non-European to win the Nobel Prize in Literature. 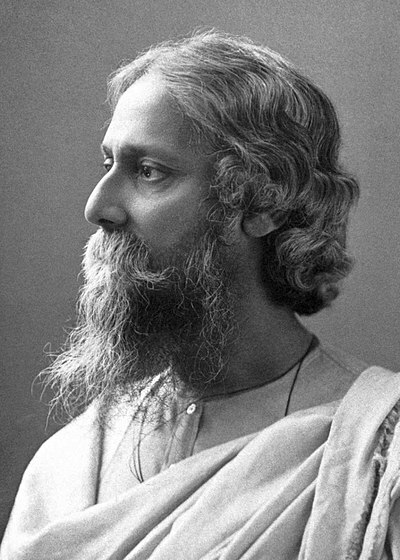 Tagore's poetic songs were viewed as spiritual and mercurial; however, his "elegant prose and magical poetry" remain largely unknown outside Bengal. He is sometimes referred to as "the Bard of Bengal". Mary Teresa Bojaxhiu, commonly known as Mother Teresa and honoured in the Roman Catholic Church as Saint Teresa of Calcutta, was an Albanian-Indian Roman Catholic nun and missionary. She was born in Skopje, then part of the Kosovo Vilayet of the Ottoman Empire. After living in North Macedonia for eighteen years, she moved to Ireland and then to India, where she lived for most of her life. Geir Lundestad is a Norwegian historian, who until 2014 served as the director of the Norwegian Nobel Institute when Olav Njølstad took over. In this capacity, he also served as the secretary of the Norwegian Nobel Committee. However, he is not a member of the committee itself. The following lists of people from India by state organise people from India by state and territory. The Right Livelihood Award is an international award to "honour and support those offering practical and exemplary answers to the most urgent challenges facing us today." The prize was established in 1980 by German-Swedish philanthropist Jakob von Uexkull, and is presented annually in early December. An international jury, invited by the five regular Right Livelihood Award board members, decides the awards in such fields as environmental protection, human rights, sustainable development, health, education, and peace. The prize money is shared among the winners, usually numbering four, and is EUR 200,000. Very often one of the four laureates receives an honorary award, which means that the other three share the prize money. ↑ Kasturi, Charu Sudan (25 August 2013). "Nobel tribute to Tagore - Stockholm to Calcutta, Sweden lines up centenary events". The Telegraph India. Archived from the original on 5 December 2018. Retrieved 5 December 2018. 1 2 "Nobel Prizes–Britannica". Encyclopaedia Britannica. Archived from the original on 29 April 2015. Retrieved 7 November 2018. ↑ "The Nobel Prize". Nobel Foundation. Archived from the original on 22 June 2013. Retrieved 7 November 2018. ↑ "A short guide to the Nobel Prize". Swedish Institute. 7 December 2018. Archived from the original on 24 January 2019. Retrieved 27 January 2019. ↑ Media, Nobel (22 November 2018). "Nobel Prize facts". Nobel Foundation. Archived from the original on 6 November 2018. Retrieved 22 November 2018. ↑ "From 1913 to 2014: Indian Nobel Prize winners". The Hindu . 10 October 2014. Retrieved 14 November 2018. ↑ Rajinder Singh (Sep 2012). "Aurobindo Gosh's Nobel nomination". Science and Culture. p. 442. Archived from the original on 8 August 2016. Retrieved 7 November 2018. ↑ Media, Nobel (22 November 2018). "Aurobindo Ghosh Nomination archive". Nobel Foundation. Archived from the original on 22 November 2018. Retrieved 22 November 2018. ↑ Levinovitz, Agneta Wallin (2001). The Nobel Prize: The First 100 Years. London: Imperial College Press, London. pp. 181–186. ISBN 9789810246655. ↑ Tønnesson, Øyvind (1 December 1999). "Mahatma Gandhi, the Missing Laureate". Nobel Foundation. Archived from the original on 2 June 2017. Retrieved 7 November 2018. ↑ Ghosh, Avijit (17 October 2006). "We missed Mahatma Gandhi". The Times of India . Retrieved 5 December 2018. ↑ Wolchover, Natalie (10 May 2011). 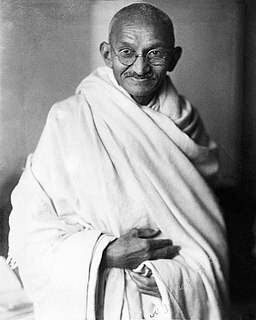 "No Peace for Gandhi". NBCNews. Archived from the original on 7 December 2018. Retrieved 6 December 2018. ↑ George, P J (10 October 2014). "List of laureates". The Hindu. Archived from the original on 12 November 2017. Retrieved 4 May 2015. ↑ "Indian Citizenship". 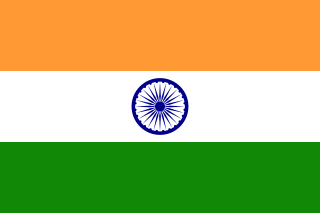 indiacode.nic.in. Archived from the original on 11 January 2015. Retrieved 7 November 2018. ↑ "Rabindranath Tagore". Nobel Foundation. Archived from the original on 11 June 2017. Retrieved 7 November 2018. ↑ "C V Raman". Nobel Foundation. Archived from the original on 17 September 2015. Retrieved 7 November 2018. ↑ "Mother Teresa Agnes". Nobel Foundation. Archived from the original on 11 June 2017. Retrieved 7 November 2018. ↑ "Press Release 1979 Peace". Nobel Foundation. 27 October 1979. Archived from the original on 24 January 2019. Retrieved 24 January 2019. ↑ "Amartya Sen". Nobel Foundation . Retrieved 14 November 2018. ↑ "The Nobel Peace Prize 2014". Nobel Foundation. Archived from the original on 10 June 2017. Retrieved 7 November 2018. ↑ "H. Gobind Khorana". Nobel Foundation. Archived from the original on 1 June 2017. Retrieved 7 November 2018. ↑ "Subramanyan Chandrasekhar". Nobel Foundation. Archived from the original on 17 June 2017. Retrieved 7 November 2018. ↑ "Venkatraman Ramakrishnan". Nobel Foundation. Archived from the original on 14 June 2017. Retrieved 7 November 2018. ↑ "Ronald Ross". Nobel Foundation. Archived from the original on 15 June 2017. Retrieved 7 November 2018. ↑ "Rudyard Kipling". Nobel Foundation. Archived from the original on 17 June 2017. Retrieved 7 November 2018. ↑ "Dalai Lama 14th". Nobel Foundation. Archived from the original on 14 April 2015. Retrieved 8 November 2018. ↑ Aarvik, Egil. "Award ceremony speech". Nobel Foundation. Archived from the original on 27 January 2019. Retrieved 27 January 2019. ↑ "Nobel Prize in Literature 2001". Nobel Foundation. Archived from the original on 1 February 2016. Retrieved 17 October 2008.